The first contest for delegates to our national political conventions is the Iowa caucus. In 2012, it will be on Monday, February 6. Iowa is a small state, with less than 1% of the nation’s population. But anticipation for the caucus consumes a huge portion of our national attention as we approach that fateful Monday evening. And money that is spent in Iowa to receive a mere handful of votes in comparison to those in primary states is astronomical. Progressives across the country have been desperately waiting for President Barack Obama to support their ideas for reform in a variety of areas. They want more than rhetoric or cautious actions. They seek a boldness reminiscent of how Franklin Roosevelt pulled us out of the Great Depression. Throughout his presidency, Barack Obama has tempered the idealism of progressives with caution that sometimes can be mistaken for paralysis. He has successfully defined himself as a centrist who works for bi-partisanship whenever possible. However, there are certain areas in which bold change is possible where it previously had not been so. The reason, spelled out, is L-A-M-E D-U-C-K. Even before a president hits a second term, issues come and go, not to return again, even if he or she serves a second term. Such is the case with the Iowa caucuses. It is indeed very much alive for the Republicans in 2012, but with President Obama facing nominal or no opposition, he will waltz through it. Where prior to the 2008 Iowa Caucus he and many in his entourage almost lived in Iowa, prior to the 2012 caucus he’ll make only a couple of pro forma visits, so as to not offend the Iowa voters to the point that they would feel that he cares so little about them that he does not value their votes in the November general election. So what we have is a perfect storm, or more accurately, a perfect opportunity for President Obama. Factor No. 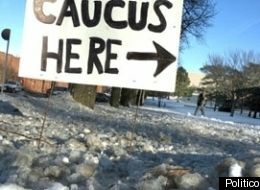 1: the 2012 Iowa Caucuses already have has name in the winning column for Democrats. Factor No. 2: the caucuses represent one of the greatest aberrations to democracy that exist in the American political system. The result of the “storm” is that President Obama can essentially say anything that he would like to about how the Iowa caucuses are designed and run, at no particular political loss. What is so bad about the Iowa caucuses? 1. They essentially determine who the front runners will be for each party’s nomination, as a result of the preferences of just a handful of voters. Record turnout in 2008 meant that 250,000 voters attended Democratic caucuses, and another 118,000 attended Republican caucuses. Those combined voters represented a pittance of the total number of Americans who would vote for president in November, to be exact, three-one thousandth of all voters. This would be equivalent to a mere 210 fans sitting at the 70,000-seat football stadium at the University of Iowa. There would be 69,690 empty seats representing all the American voters who could or did not participate in the Iowa caucuses. 2. The money spent on the Iowa caucuses make a mockery of any attempt to limit the amount of money in the American political process. In 2008, Hillary Clinton spent $29 million to garner 74,000 votes and come in third place. That comes out to $392 per vote. In contrast, when I ran for Congress in 2010, I spent $50 thousand to gain 77,000 votes or 64-cents per vote and came in second. 3. The Iowa caucuses are in January or February, the dead of winter. Temperatures rarely reach freezing. and the roads are often covered with snow or ice. It is not an inviting time to go to an evening caucus, and it is downright dangerous for the elderly, infirm, or injured. 4. There is no provision for absentee voting which means that anyone who works the night shift or who is at home taking care of a child is excluded from the process, no matter how strongly they have a preference among the candidates. 5. There are voters, particularly in rural areas, who do not live close to the nearest caucus location. They are either excluded from the process or face special hardships. 6. The African-American population of Iowa is 2%, compared to the national percentage of 13%. The Hispanic population of Iowa is 5%, compared to the national percentage of 16%. Iowa is hardly a demographic microcosm of the United States. For these and other reasons, the influence of Iowa on selecting our candidates running for president is both excessive and a mockery. However, it persists from one election cycle to another. The change will not come from the state of Iowa because tens of millions of dollars are spent in the state that would not be if it was not first in the nation. Additionally, it receives priceless news coverage, generally portraying the state as quaint and idyllic. It has no motivation to initiate any changes. Any candidate who will be running competitively in Iowa in the future would be foolish to challenge the system. The only thing that he or she would gain is the enmity of the voters. However, President Obama is free to challenge the Iowa system. This is different from taking on the Electoral College because he still needs to wind his way through it on a presumed path to victory in November, 2012. Challenging the system in Iowa now is preferable to waiting until 2016 because the Democrats will once again be competitively involved in the caucuses at that time. There is a line of conventional wisdom that President Obama has chosen a cautious path during his first term, but if reelected he will utilize his position as a lame duck to propose and energetically advocate the reform that so many of his supporters thought he embraced when he ran in 2008. However, if we have learned anything about this man of many mysteries, it is to judge him on his actions rather than our own interpretations of what he really supports. We can only hope that President Obama presently initiates discussion on reforming our electoral process, with an initial focus on the undemocratic nature of the Iowa caucuses. If he does not, the travesty of Iowa will continue until some other reform-minded president wants to take it on. Additionally, engagement by the president will stir his liberal base into thinking that the reform-minded president for whom they thought they voted in 2008 is only waiting for the right opportunity to advocate that reform. If President Obama remains silent about the Iowa process, it bodes poorly for what kind of agenda we could expect from him in a second term.